We are the leading manufacturers of Tube bundle heat exchanger in India and available in a variety of designs and materials of construction. We having 23 years in this industry and JC Equipments makes three different models of tube bundle heat exchangers Which are designed for either horizontal or vertical use and Water Makers are made up of U tube Heat Exchangers. We manufacture the Cross flow tube bundle heat exchangers are often used in highly fouling environments such as lignite utility boilers. We are manufacturing of the heat transfer equipments asper the TEMA [Tubular Exchanger Manufacturers Association] standards, ASTM section(VIII)(unfired pressure vessuls), is-4503, is-6088 standards. And asper bs, din standard's and is 2825 is 6088 codes. 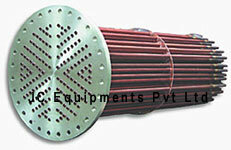 JC Heat exchanger designed for installation with vertical tube bundle. Our new design increases the higher heat transfer rates.